This crystal has quite a story and really is a hitchhiker as Mary never intended to purchase the crystal at the Springfield show. Towards the end of the show Mary was finalizing an order with a vendor who was frantically searching for this crystal, having recently unwrapped it. 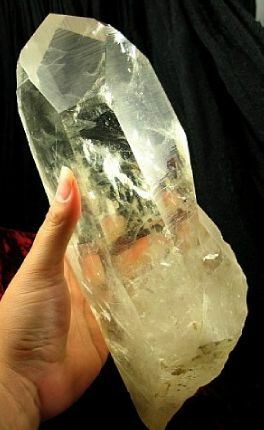 As she was purchasing some other crystals including a different Lemurian he asked if she was interested in the beauty. Even though the Lemurian took her breath away, trying to be budget conscious, she declined to purchase it. Bryan finished up the transaction and collected the boxes of crystals. Upon returning to Bryan's home in New York, we were all gathered reviewing all the finds of the Springfield show. Imagine Mary's shock to discover that this crystal was indeed in her purchases! Weighing in at over eight pounds, this is crystal is not a light hitchhiker! After much deliberation, regardless of budget, any crystal that went to these lengths was not going to be returned! That being said, it is clear that this determined spirit wishes to continue its travels. Needless to say, we really don't know too much about the story of this crystal. We do not know if it from the original mine or the newer mine. 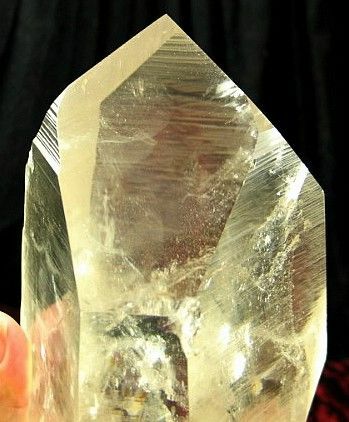 A large bridge crystal nestles at the side of this stunning dow Lemurian seed crystal. The interior clarity is stunning reflecting light and rainbows. The sides have a shiny luster with obvious horizontal striations. The faces have been lightly retouched retaining the evidence of the presence etchings on the faces. 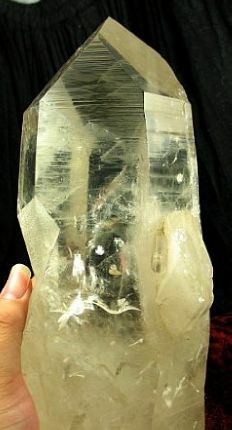 There are completely natural areas on the crystal such as the contact area on the side, and the self-healing base. A few minor bruises are still present, but are easily overlooked. To say this crystal has a determined spirit would be just a slight understatement, however the energy is surprisingly gentle. Unconditional love and acceptance radiate from this spirit which shifts from masculine to feminine depending on its mood. A master teacher who will open your spiritual side to new dimension working with you every step of the way. Open yourself to love and joy while you explore endless potential with this beautiful spirit. 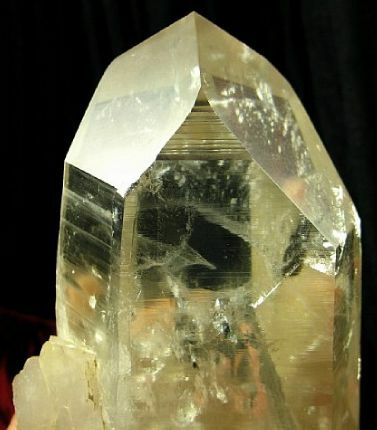 The Transmitter/Channeler quartz crystal is recognized by a configuration of three seven-sided faces, adjacent (on both sides) to a three-sided face. This structure combines the qualities of the transmitter crystal and the channeling crystal. Some people call these crystals Dow or Tao crystals. They provide for a continuous connective force between the holder of the crystal and "All That Is". It is the crystal for creativity and service to humanity through both spiritual and mystical pursuits. It allows access to the records relating to each question or thought and, even without focusing, provides intuitive awareness in all situation. 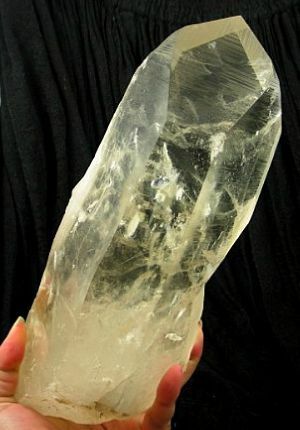 Lemurian Seed Crystals were found at the top of a hill that was being strip-mined for quartz in Brazil. What made these crystals unusual is that these naturally formed crystals were found separately in sand, and were not attached to clusters. Many have a pink to reddish glow, but they are also found in golds of citrine, browns of smoky and sometimes smoky-citrine. The vast majority of these unique crystals are clear quartz, but instead of being shiny, they appear frosted or dull - like they have a matte finish. 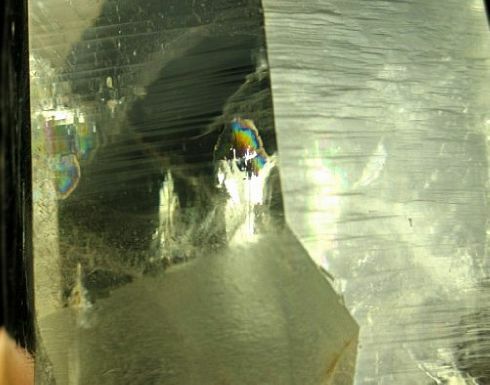 Their most unique characteristic is a series of horizontal striations running up one or more sides of the crystals. Usually, these distinct horizontal striations end in a triangular face, forming the apex of the crystal. Lemurian Seed Crystals are believed to be a gift from the earth from the far reaches of the ancient civilization of Lemuria. 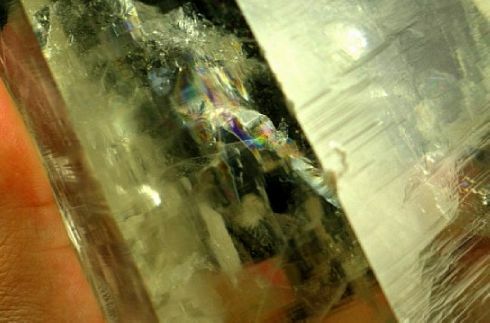 What appears to be a clouded appearance are, in fact, the growth lines or striations of the crystal, recording the ancient knowledge of Lemuria. It is believed that although the physical civilization ended, the consciousness of Lemuria has never left, but has been kept alive in the earth with records of that precious knowledge being seeded in the crystals for later use. Lemurian seed crystals assist in creating a holographic connection between inner earth, the surface of earth, as well as with the stellar regions. Lemurian Seeds can be used to open and cleanse all chakras and meridians. It is particularly powerful in opening and expanding the Heart chakra. Once open and cleared, the energy of the chakras and meridians can allow one to make well-supported transformational changes in their life. These crystals are a blending of "down-to-Earth" energy with the mystical realms of the past, other present, and future. The energy in Lemurian Seeds multiplies and focuses the overall energy of Quartz many times. Lemurian Seed Crystal Quartz carries an understanding of polarities (yin/yang, male/female, good/bad, right/wrong). With polarity as a focus, a person can see that all issues have multiple viewpoints and that by understanding these and integrating them, a person can produce a better overall Whole Self within.